Brighton and Hove Open Door 2012 for @heritageopenday is live! Stage Brighton & Hove Open Door as a part of the national Heritage Open Days celebration of England’s architecture and culture, itself a part of the overarching European Heritage Days. This year, they are offering a really exciting programme of events, with over 100 activities on offer. An afternoon of events for Heritage Open Days on Thursday 6th September, celebrating the role of ritual in our lives through family rituals, including dance performances from Ragroof Theatre, creative workshops with Jane Fordham, and Clare Nias and a talk on Victorian Mourning rituals from local historian Sarah Tobias, apt given that Fabrica is based in an old church! Catherine Tajima Powell will be exhibiting her ‘Traces’ work for the event. This afternoon is FREE and open to all, including refreshments between 1-4pm. There will also be a presentation by Cecile Chevalier. All washed down with free tea and cake! Now there’s a ritual! this free event, part of the national Heritage Open Days programme with a showing of the Oscar award winning film, Tango, by Carlos Saura. This film looks at the passion and ritualistic nature of Tango and it’s community. The film showing is a recession busting £1 and includes wine and other refreshments. Doors open for this at 6pm and the film starts at 6.20pm. All welcome! The Laughter Lines event at Fabrica gallery on Thursday 23rd June was really well attended from all sections of the community. Strike a Light curated an event linking artists, film, performance, stand up, and a heritage talk about old time music hall which were well received. The evening film of The Artist had record attendances, helped in part by the free bar! The next event at Fabrica organised by Strike a Light will be on Thursday 6th September from 1-4pm, as part of Heritage Open Days including dance performances from Ragroof Theatre, creative workshops with Jane Fordham, and Clare Nias and a talk on Victorian Mourning rituals from local historian Sarah Tobias This afternoon is FREE and open to all, including refreshments. 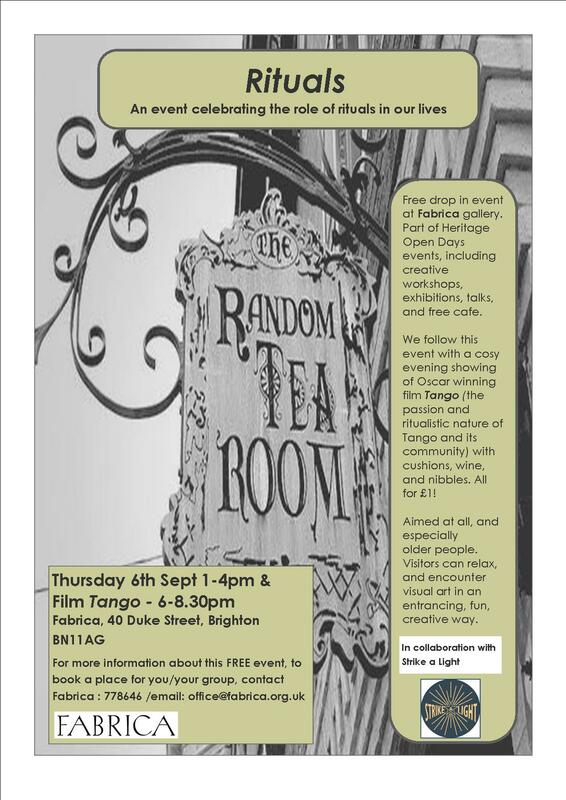 This will be followed by a film showing of Tango, the Oscar winning film from Spanish Director Carlos Saura, looking at the passion and ritualistic nature of Tango and it’s community.The film showing is a recession busting £1 and includes wine and other refreshments. Doors open for this at 6pm and the film starts at 6.20pm. ‘Looking back on my life, I wish there had been more laughter in it: more witticisms given and received – more fun and sparkle and repartee’. I still believe the best laughs are the ones you have with your friends. There is something about a group of women together that beats everything. Shorthand conversations where everyone understands everything without having to go into explanations’. ‘Laughter is the best facelift’. ‘There was such a lot of laughter when I was young, and first married. .. It is a long time since I laughed till I cried and my chest ached… but I live in hope’. ‘Telling jokes is an art form possessed by few as such it cannot be learned’. Showcasing a new project, Carnivaltastic set up by Lorraine Prince which Strike a Light will link up with to offer creative workshops specifically looking at carnival, and celebrating the festival vibe. Carnivaltastic will offer workshops, team building, events, festivals, and hen parties so everyone can enjoy access to carnival, creative arts and music. They would love to hear from you if you’re interested in any element of their carnival workshops. Carnivaltastic are flexible and able to work with all client groups, accommodating a range of needs. Contact them on info@carnivaltastic.co.uk or call 07904 526 138.